I had thoughts of doing a "best of" list of articles I wrote this year, but I've done that in past years and I'm not sure there was any benefit for readers by doing this exercise. Instead, I'm going to close 2012 by trying to reach my goal of reading fifty books this year, and this book capped off a great year. 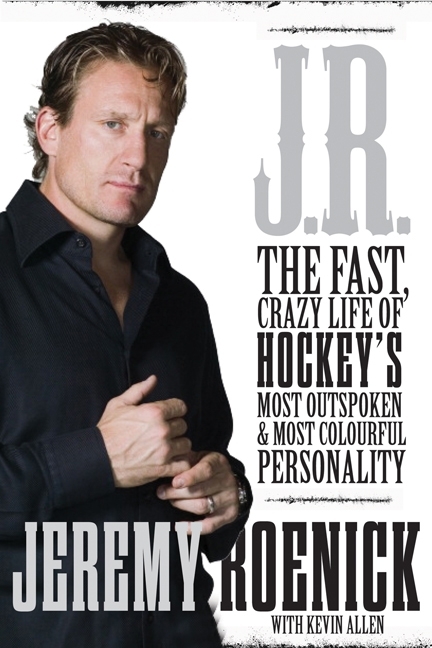 Teebz's Book Club is proud to review J.R.: The Fast, Crazy Life of Hockey's Most Outspoken & Most Colorful Personality, written by Jeremy Roenick with Kevin Allen and published by HarperCollins Publishers Ltd. If the subtitle of the book is any indication, "outspoken" and "colorful" are indeed the tip of the iceberg as Jeremy Roenick speaks openly and candidly about everything in this book. The result is a highly entertaining and very enjoyable read about one of hockey's greatest stars. and is a popular hockey commentator and media personality. Follow him on Twitter @Jeremy_Roenick and become a fan on Facebook." Jeremy Roenick was one of hockey's best players during his time in Chicago, but this book is so much more than just a reflective book on his hockey career. In J.R., Roenick looks at all of his dealings in hockey, from being a tyke in minor hockey right through to his retirement. The stories he tells from his experiences will make you laugh and certainly give you a better understanding of the man regularly seen on NBC hockey broadcasts. Roenick isn't just honest in this book. He is candid about the players he played with and against, the men who coached him, his wife and family, his career as a whole, his vices, and his demons. He doesn't back away from his opinions, and certainly uses enough colorful language that you'd think you were out for a beer with the guy. While some may shy away from that language, I find that it solidifies the image of Jeremy Roenick in J.R.: a tough, gritty, take-no-prisoners player who seemingly scored at will. "It was at that time that my relationship with Goodenow broke down. I respected him for what he had done for the NHLPA. Certainly, I benefited from the work Goodenow had doen to raise salaries early in my career. When salaries became public under his watch, the escalated dramatically. But somewhere along the line, he seemed to losed track of the reality that he was working for us and not the other way around. He never yelled at me, I didn't like being around him because of his arrogance. When he answered a question, it always seemed that he was telling you what your opinion should be. He was condescending and made you feel that his word was final. I had the feeling he didn't respect the opinion of any player who didn't agree with him." And that's the kind of candid and honest writing you'll find in J.R.. There is no topic that Jeremy Roenick doesn't tackle, and he takes you behind the scenes into the dressing room and private airplanes where the players escape some of the prying eyes of the media and fans. While he does protect players by not naming players in some situations, the situations are certainly not off the table. He describes some very funny situations, but omits names as he sees fit. I have no problem with this. J.R.: The Fast, Crazy Life of Hockey's Most Outspoken & Most Colorful Personality is a fantastic look at life in the NHL through the eyes of Jeremy Roenick. I read this book in one sitting because it was funny and entertaining, and I'm sure that you'll find his recollections of NHL life to be very enjoyable as well. I have to say that due the R-rated language used over the 304 pages that this book is definitely for adults, but it's one that all hockey fans will like. Because of Roenick's funny stories, honesty, openness, and solid writing, J.R.: The Fast, Crazy Life of Hockey's Most Outspoken & Most Colorful Personality absolutely deserves the Teebz's Book Club Seal of Approval, and is one of my favorite books this year! Pick it up for yourself or another adult hockey fan, and let them laugh at Roenick's stories as J.R.'s books will certainly be a great read for any mature hockey fan. Even if you don't like Roenick, his insight into many stories will give you a better perspective on what goes on behind closed doors in the NHL! While the Canadian junior players were downing the Americans in Ufa, Russia, another Canadian team found its way to the final in their respective tournament. 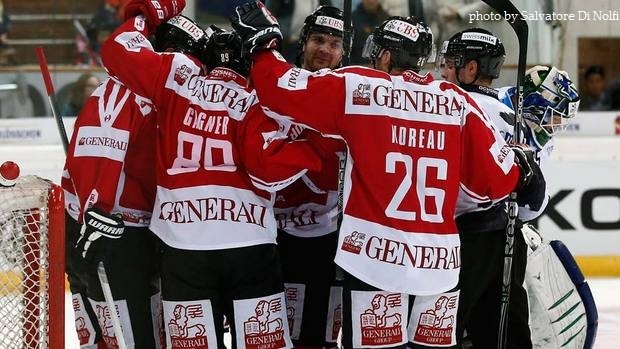 The Canadian Spengler Cup entry downed Swiss-based HC Fribourg by a 5-1 score to capture one of the berths in the final. They'll meet the Joe Thornton-led HC Davos squad on the other side as the home team Davos downed HC Vitkovice Steel by a 5-4 score yesterday to advance. It took them a couple of games, but Canada has gelled and looked impressive in their last couple of games as they roll into the final. Let's take nothing away from head coach Doug Shedden and assistant coach Chris McSorley. They have done a magnificent job in getting the NHL players to buy into their system, and they have lines that are clicking very well. In some cases, teammates are making the difference, but there are guys who haven't played with each other in their careers at this point who look like they've spent the last five years on the same line. Shedden was in an unenviable position at the start of this tournament. If this NHL player-laden squad had come into the Spengler Cup and lost, he would have been crucified for not getting the players to perform. After all, he has nearly a dozen players who spent time in the NHL last season, and anything less than the championship would be considered a failure. On the other hand, Shedden's accomplishments as a coach will be downplayed by a vast number of fans due to the fact that he was lucky enough to be able to pull together a team like this. He was expected to win with this talent-laden squad, and it's probably pretty easy to knock off a few European club teams with half of an NHL All-Star team. All Shedden had to do was tap a few guys on the shoulders and there would be pucks filling the net. If you caught the first game against Adler Mannheim, that was simply not the case. The Canadians struggled to find any sort of chemistry as they put a measly one goal on the board against Germany's top team this year. Mannheim showed that they could skate with the Canadians, but they were clearly not as talented as the Canadians. But the result spoke volumes about how hard Mannheim outworked Canada as they captured a 2-1 victory. Suddenly, Canada was not invincible. Canada, finding themselves in a position where the game against Davos was nearly a must-win game, came out with some new lines against the host squad, and hammered Davos by a 5-0 score. Make no mistake that the new line combinations worked well as they capitalized on a number of chances, but the Canadian team looked vastly superior to their Swiss counterparts in this game. "None of these guys were happy about losing last night and they certainly showed it in their play tonight," Doug Shedden told The Canadian Press. "We put a system in place in the neutral zone that wouldn't let Davos play their style of hockey." The fact that they changed up their system and got immediate buy-in from these players shows that the players trust their coaches. With the success of that system, there should be no doubt that Shedden is playing a major role in writing the story of this team. After Davos knocked Mannheim off, Canada would advance to the semi-finals with the bye after winning the pool. It was here that they met HC Fribourg, and Canada outclassed the other Swiss squad by a large margin as well. There was little doubt about the outcome when watching the game as Canada seemingly spent a vast majority of the game with the puck on their sticks. While the talent of the team played a large part in keeping the puck stuck to Canadian sticks, it still takes a competent bench boss to roll players out whose styles mesh with one another. Having star NHL players dropping to block shots and taking hits to make plays in a tournament where they could have just played like it was an All-Star Game is evidence that this team has pride and listens to their coach. "When you see guys like Jason Spezza blocking shots and backchecking like he was (on Thursday), that's great to see," he said. "This is a team that is starting to buy in to a system, and everyone is doing their part." Everyone needs to realize that no matter how good a team is, they still need a general who assembles them on the battlefield. Scotty Bowman is regarded as the best bench coach of all-time due to his success over the years, and he's coached some excellent teams. He hasn't always been successful, but, as he aged and became more experienced, winning was more of an expectation than a hope. While Shedden is not quite at the level of a Toe Blake or Scotty Bowman, he has rolled four lines and eight defencemen with success and made the right calls with respect to his goaltenders. His choices have led Canada to an expected berth in the final, but it didn't look that way after the loss to Adler Mannheim. A switch of the system and some juggling of players on lines, however, have resulted in much greater success. A coach can get his team to win games. A good coach can make changes to his lineup and/or system and see some wins result from it. But a great coach gets his players to buy into his changes seamlessly to result in greater success. Shedden and McSorley have done this, and got the buy-in they needed to succeed at a high level. I'm guessing that Shedden would have had great results regardless of the amount of NHL talent he has assembled on his bench because he knows how to coach. I want to follow up on a question I had posed some time ago about the vegetable to the left and its tie-in to the Edmonton Oilers' run of Stanley Cup in the 1980s. Back in June of 2007, I had written an article about some of the Stanley Cup rings given out over the years. There were impressive pieces of jewellry handed out, but the Oilers' 1984 Stanley Cup rings caught my eye because they had a carrot engraved into the right side. At the time, I had asked if anyone knew why there may be a carrot on a Stanley Cup ring, but I received no feedback. Instead, I went off looking for an answer and actually found one! The problem? I never actually published the reason for the carrot! Thanks to a reader, I will now post the reason for the Oilers' carrot-adorned rings. My name is Devyn and I'm extremely interested in finding out why there is a carrot on the one side under the Oilers logo on there Stanley cup ring. I see in your blog you posted you were wondering the same thing... I was wondering if you got a answer? I realize you posted this in 2007... So maybe you had time to find out lol. Thanks to Devyn's prompting me to find an answer, I quickly hit my hockey favorites tab on my web browser, and shot him back a link containing the reason for the root veggie's appearance. So without further adieu and an assist from Devyn, here's the story of the Edmonton Oilers' carrot rings. The above-linked Edmonton Journal article, written by David Staples and published on Sunday, September 18, 2011, is an interview with long-time Oilers trainer Barrie Stafford. Stafford was there for the good times, the bad times, and every other time in between for the 28 years before he retired in 2011, and he knew about the vast majority of stuff that went on within the Oilers organization. It's in this interview that Mr. Stafford reveals the reason for the carrots on the Stanley Cup rings. Pocklington and Sather, especially, were tight with a dollar, but they loved to give players financial incentives. 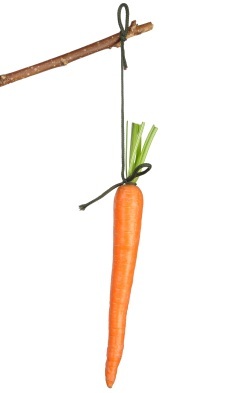 Those incentives were symbolized by the carrots image cut into the team's Stanley Cup rings, one bite out of the carrot for each Cup victory. Each year when the playoffs would come along, Sather would negotiate incentives with his players. Gretzky, Messier and the team leaders would get together at a team party and come up with their wish list, maybe suits from tailor Sam Abouhassan if they won one round, a trip to Hawaii if they won the Cup. In the minutes before one big playoff game against Los Angeles, Sather announced to the players that Pocklington was coming into the dressing room, a major breach of protocol. "Everybody is going, 'What is he doing here?' Basically nobody cares if he's the owner. Nobody is allowed in this dressing room before the game. It's unheard of." But in came Pocklington, carrying a brown paper bag, with garden carrots sticking out of the top. He set down the bag on the Ping-Pong table. "So Peter says, 'OK boys, this is an important game for us tonight, and you know, just wanted to give you a little incentive.' Boom! Peter hits the bag, it comes apart and it's full of carrots and cash, $100,000. One hundred grand cash sitting in the middle of the dressing room! We've never seen money like that! 'OK boys,' Sather said, 'It's time to go.' "
After the game, a series-clinching Oilers win, Messier doled out the cash, an equal share to each player and trainer. "I had never seen so much money in my life," Stafford says. "That was a big deal for us. 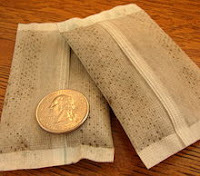 I remember putting the money in my shirt pocket and I felt I had just won the lottery. 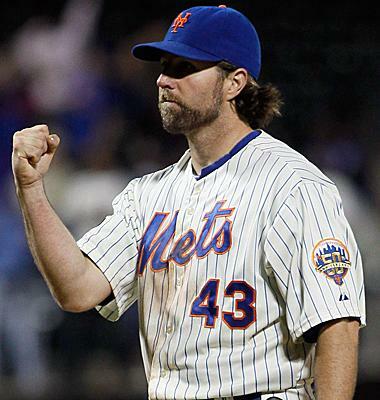 Like I said, it's like Pavlov and the salivating dog: only good things happen when you win." Among the rewards were playoff bonuses, Stanley Cup rings and Stafford's name on the Stanley Cup. "All I know is my name is on the Cup five times and they're not taking it off. It's an unbelievable feeling." Pretty impressive story, right? I mean, what owner would come into the dressing room before a big game with a bag of carrots and a bundle of money as incentive to win the game? Because Mr. Stafford said this was a game against the Los Angeles Kings, this had to have been from the 1985 Stanley Cup Playoffs where the Oilers dispatched the Kings in three-straight games in the opening round. But the imagery of the carrots had to have been around long before that for the players to understand what it meant! So that's the story about the carrot on the Oilers' 1984 Stanley Cup ring. Like dangling a carrot in front of the team, Peter Pocklington and Glen Sather would dangle incentives like cash, vacations, and luxuries for every series victory that the team earned. Is it any wonder why the Oilers seemed to be more determined to win in the playoffs during those heady days? If you're a casual listener or a fan of The Hockey Show, you know that Beans and I have been beating the drum for people to abandon this "only the NHL" stance when it comes to watching hockey. There is a ton of excellent and fun hockey out there for people to watch, and we've been encouraging everyone to get out and see whatever hockey they can - AHL, CHL, USHL, NCAA, CIS, tykes, peewees - in order to appreciate the game itself. Thankfully, there are some corporate sponsors of grassroots hockey helping the players and the fans appreciate the game a little more. A reader by the name of Rebecca B. wanted me to share the following video with you. I have seen it on TV with the World Junior Championships dominating the Canadian sports scene right now. But it IS an excellent video that will hopefully prompt some of you to get out and discover the purity of the game by watching it at the grassroots level. Here is the video that Rebecca wanted me to share with you that the Royal Bank of Canada produced for the World Junior Championships period. The above video profiles a team of seven year-old kids as they lace up their skates, tape their sticks, get tips from their coach before taking to the ice. The message in the video is very simple: as long as we keep playing the game we love, hockey never stops. In Canada, we are a nation obsessed with this game, so we should be supporting the game at the grassroots level like never before thanks to the void left by the NHL-NHLPA bickering. Again, on The Hockey Show we've been preaching about going to see other hockey with the NHL and NHLPA seemingly unwilling to come back to work. I think that the above video speaks volumes about what it means for this country to be a "hockey nation". Go watch the kids play. Go enjoy the innocence and unbridled passion of the game shown by these kids as they learn the game and make it fun. Watch their smiles light up the ice, and see them cheer when someone scores a goal. Hockey isn't about millionaires and billionaires. It never should be. It should be about the game and the joy it brings to all. When it becomes about money, there is no joy or fun because those factors are lost amongst the dollars and cents. Whatever your plans are this weekend, go see a game. I guarantee that you'll have a great time! Thanks for sending me a great reminder, Rebecca! The Hockey Show, airing tonight at 6:00PM CT on 101.5 UMFM, will feature a special guest as we welcome MJHL linesman Jeremie Gauvin into the studio! Jeremie will be with us for the full half-hour, so please tune in and hear us chat with him! We'll also try to take a few phone calls, so call in with your questions at (204) 269-8636! We'll be talking with Jeremie about some of the challenges he experiences while officiating in the MJHL and other leagues, his experiences in going to the various officiating camps as he works his way up the ladder towards his NHL goal, and some of his favorite moments from games in which he's been a part. It should be a good episode as we gain perspective on the game from the view of a man in stripes! Also, I want to thank everyone who called in for the Secret Santa show last week for making it a fun episode. We will be giving out more prizes coming up in the new year, so please keep listening live on 101.5 UMFM and on the UMFM website. Thanks, listeners! 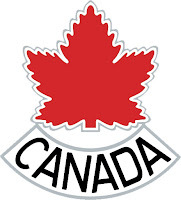 While I realize that today, for most people, is World Junior Championship day as all of the teams begin the quest for gold in the IIHF Under-20 tournament, there is another Canadian team searching for success in Davos, Switzerland. 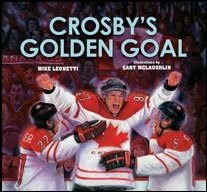 There aren't a lot of books written about either tournament, but because today is about Team Canada embarking on another gold medal trek, Teebz's Book Club will be reviewing Crosby's Golden Goal, written by Mike Leonetti, illustrated by Gary McLaughlin, and published by Scholastic Canada. While it could be argued that this was the most important goal in Canadian hockey history, it is certainly one of the most memorable. Mike Leonetti has written a number of hockey-centric books, including Canadiens Legends, Maple Leafs Top 100 Players, The Rocket, and The Mighty Tim Horton, all of which were reviewed right here on Hockey Blog In Canada. Mr. Leonetti lives in Woodbridge, Ontario, with his wife, Maria, and their son, David. Illustrator Gary McLaughlin is probably best known for his piece Blue Sky-White Snow in which he painted every member of the Maple Leafs from 1927-2007 onto a 6x12' canvas! 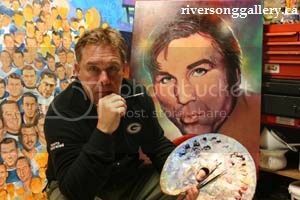 His "rich hockey illustrations have been commissioned by the Toronto Maple Leafs, the Hockey Hall of Fame and Bobby Hull". He is a full-time artist, and lives in Neustadt, Ontario. You can see more of his works at www.riversonggallery.ca. Crosby's Golden Goal will certainly be more relevant for younger readers as this goal only happened a few years ago. For anyone who was watching the Vancouver Olympic Games, the replay of the goal is probably still burned into your mind, especially if you're a Canadian or American hockey fan. Where Crosby's Golden Goal is a little different is that Mr. Leonetti tells the story through the eyes of one young fan who was sitting in the stands during the gold medal game. The young hockey fan's name is Tyler, and he's a hockey player himself. Tyler had found that the game of hockey was losing its lustre as he wasn't having fun any longer, and Tyler needed to rediscover that missing spark. After Tyler decides to quit playing, he spends more time with his family and watching one of his favorite players in Sidney Crosby. He even got to watch him at the Winter Classic in Buffalo as he attended the game! Tyler was impressed with Team Canada's 8-0 drubbing of the Norwegians, but he knew bigger and better teams awaited Canada. The gold medal game was exciting as Canada took a 2-1 lead into the third period. A Zach Parise goal with just 25 seconds tied the game much to the chagrin of Tyler and the Canadian fans! Overtime was coming up, and, if no one scored in the extra frame, a shootout would take place to determine the gold medal winners! As you're probably aware, Crosby and Iginla were the two men that made the golden goal possible as Iginla fed Crosby the puck as he skated out of the corner, and Crosby fired it through the poke-checking Ryan Miller. Canada would indeed win the 2010 Olympic Ice Hockey gold medal, and Tyler and his father would return home happy! Crosby's Golden Goal doesn't end there, though. Tyler, who had found his passion again in seeing Crosby's goal, had quit his hockey team. Would Tyler return to hockey? Was there a spot on the team for him? Would he be welcomed back by his teammates and coaches? Crosby's Golden Goal has some great artwork on the pages in the book as well. Mr. McLaughlin's illustrations are done extremely well, shifting between great definition to focus the eyes on the subject while allowing the background to be a little fuzzier. If there was any question or doubt to Mr. McLaughlin's work, the images added for this book how just how talented he is as an artist. Crosby's Golden Goal teaches children a great lesson in terms of finding the fun in any activity. While it sometimes requires one to take a step back, finding that passion for whatever activity it is becomes vital in having fun. That lesson cannot be forgotten as many NHL players have most likely experienced the same lesson that Tyler did. Because of this important lesson, Mr. McLaughlin's great illustrations, and the good story woven by Mr. Leonetti, Crosby's Golden Goal certainly deserves the Teebz's Book Club Seal of Approval! The 30-page story would be perfect for a young reader who loves the game of hockey but may be experiencing a little burnout from all the hockey he or she is playing. I highly recommend this book for any novice reader as the story is very relevant for any young hockey fan! It's Christmas today, and I have a jam-packed agenda today. My better half and I will be on the road to my parents' place today for a little home cooking and some laughter, we'll stop in at home to clean out the four-wheel drive sleigh of all of the gifts they have for us, and then we're off to her family's event tonight. Needless to say, I will probably not be around much today. I did want to say that I received no official NHL merchandise today as per requested. I'm not really into supporting the NHL or the NHLPA today based upon the number of everyday people their greediness has affected. To anyone who has been put out of work over this idiotic CBA fight, hang in there and know that HBIC supports you more than I support the NHL or NHLPA. Everyone forgets how important the ushers, concessions people, and the myriad of other people are to the game experience. I did, however, get a couple more books for Teebz's Hockey Library today, though. I will have the honour of reviewing Jeremy Roenick's new book, J.R.: The Fast, Crazy Life of Hockey's Most Outspoken & Most Colorful Personality, and Derek Sanderson's book, Crossing the Line: The Outrageous Story of a Hockey Original. I am most excited to read these books, so watch for some upcoming reviews on these! As for tomorrow, I will be watching a lot of hockey. As I posted a couple of days ago, there are World Junior Championship games, Spengler Cup games, and a few AHL games on over this holiday season, and I'll happily be absorbing as many of these games as possible. I will post a quick book review tomorrow, though, and things will return to normal on Thursday as we get set for another episode of The Hockey Show. Merry Christmas to all! Here's hoping your Christmas is the best day of the year! With the Christmas holiday season upon us, I'm probably going to be busy over the next couple of days with family, friends, and events surrounding this portion of the calendar. Of course, there will be much hockey broadcast over the next few days as Team Canada takes to the ice at both the World Junior Championship in Ufa, Russia and at the Spengler Cup in Davos, Switzerland. We may even sneak a little AHL action into the mix as well. Of course, one has to be near a TV to see the action, but I'm going to post the day-by-day schedule of hockey you will be able to watch depending on what your cable package provides. I will also post the NHL Network's coverage of Team USA's World Junior Championship schedule because it is available in Canada. For a country starving for excellent hockey action, one should be able to quench that undying thirst for high-quality hockey over the next couple of weeks with this schedule. All times will be in Eastern Time followed by Pacific Time to help with your scheduling of your life around the hockey broadcasts. Pencil in those dates, kids. As you can see, I color coordinated the various channels as well so you can figure out what is airing on each channel by a simple glance. As far as I'm concerned, though, I'm excited for the games to start on Boxing Day! To all my readers, thanks for making this another enjoyable year as we embarked on some fun projects this year. Merry Christmas to all, Happy Holidays to those who celebrated other holidays, and let's enjoy some hockey! As you may have guessed with my affinity towards hockey history, I like hockey trivia. I will say, however, that I'm nowhere even close to being a hockey trivia genius like the man featured today. I was reading through his latest publication, and I have to admit that I'm blown away with what he knows and what I honestly didn't know. I'm pretty sure that Liam Maguire will forget more about hockey trivia than I'll ever know, so Teebz's Book Club is proud to review Next Goal Wins!, written by Liam Maguire and published by Random House Canada. I've reviewed hockey trivia books in the past, and it's tough to find a lot of reason to re-read these books. Mr. Maguire's Next Goal Wins! is jam-packed with so much information that you'll have to read it again to absorb everything contained within the covers! 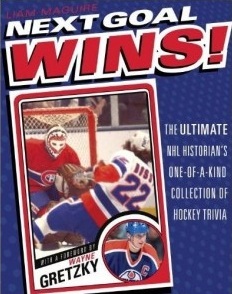 From the book's cover, "Liam Maguire became Canada's unofficial hockey trivia expert in 1981. Since then he has made many appearances across the country at speaking engagements, on television and on radio. 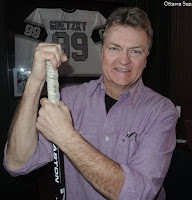 He is the president of Liam Maguire's Ultimate Hockey, a hockey portal found at www.liammaguiresultimatehockey.com. Liam has been involved in the sport of hockey, as a fan and participant, for 46 years. He attended 344 games at the Montreal Forum from May 1, 1975, until March 11, 1996. He lives, sleeps, eats and breathes hockey. Liam lives in Osgoode, Ontario, with his two children." Next Goal Wins! is filled with a ton of hockey trivia that one may not even consider. There are sections that highlight pieces of trivia from each team's history, the best players, defunct teams, Stanley Cup anecdotes, and even the questions that Liam Maguire gets asked most often. Needless to say, the amount of information contained within the covers is plentiful! I am simply amazed at how much I didn't know in comparison to Mr. Maguire. For example, Phoenix's third coach, Bob Francis, added his name to a very select few names when he was given the job as Coyotes head coach. His father, Emile Francis, coached the New York Rangers, and these men are one of four father-son combinations to have coached NHL teams. Do you know who the other three combinations are? The answer is at the bottom of this article! Being that we're a couple of days away from Christmas, were you aware that the NHL played on Christmas Day from 1920-1971? If you read Next Goal Wins!, you'll know that the New York Rangers played the most games on Christmas Day with 38 games played, and have the best record on Christmas Day of all the teams that played at 25-11-2. That's a pretty impressive mark for games played on Christmas Day considering that Chicago is second-best at 15-14-8! The section in Next Goal Wins! on defunct teams is pretty impressive with all the trivia that Mr. Maguire provides. Every defunct team is highlighted - the Montreal Wanderers, the Quebec Bulldogs, the Pittsburgh Pirates, the Cleveland Barons - with some pretty interesting facts: who scored the first goal in each team's history, who scored the last goal in each team's history, and a myraid of other facts about these forgotten teams. Next Goal Wins! 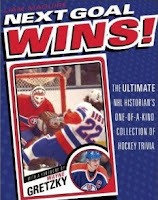 is an excellent source of information that will satiate any hockey historian's or hockey trivia buff's need. I found myself astounded with some of the excellent information in Next Goal Wins!, and I'm very impressed with Mr. Maguire's outstanding hockey knowledge. Because of the vast quantity of facts and information in the book, Next Goal Wins! absolutely deserves the Teebz's Book Club Seal of Approval! Thanks for reading this review, and the answer for the father-son coaching combinations are as follows: Lester Patrick and his son Lynn Patrick, Lynn Patrick and his son Craig Patrick, and Larry Wilson and his son Ron Wilson. Pretty incredible to see the lineages! The AHL's Bridgeport Sound Tigers are the closest professional hockey team to Newtown, Connecticut where 26 innocent people lost their lives. The Sound Tigers took to the ice tonight wearing the names of the children who lost their lives in the tragedy, and allowed any Newport resident to attend tonight's game for free. In addition to this, the games on December 26 and 29 will also feature free admission for Newtown residents. While this may seem like small potatoes in terms of what the team could do, perhaps seeing a hockey game can allow a few people who are living in the tragedy an escape from the sadness hanging over Newtown. In any case, the Sound Tigers are wearing the names of the children who were taken far too early from their families. In honour of the children who were lost in this senseless tragedy, I will list the Sound Tiger players and the name of the child each player wore with the child's age in parentheses. For the next week, the Sound Tigers will remember these children by honouring them on their uniforms. The last name on that list - Ana Marquez-Greene, as shown to the left - hits a little closer to home. Miss Marquez-Greene and her family had moved to Connecticut from Winnipeg recently, and were settling into their new lives when Adam Lanza committed his horrific act. Jimmy Greene, Ana's father, is a Hartford native, and taught for three years at the University of Manitoba's Faculty of Music. Nelba Marquez-Greene, Ana's mother, worked at the University of Winnipeg. Mr. Greene had decided to take a position as music professor and assistant jazz program coordinator at Western Connecticut State University in Danbury, Connecticut, prompting the move to Newtown a short drive from Danbury. I'm quite certain that the Marquez-Greene family never expected this to happen just as the town never expected something like this to happen. It's tough enough to get acclimatized to a new town, school, and neighborhood, but this is beyond difficult. I want the Marquez-Greene family to know that they are in my thoughts and prayers during this most difficult time. I didn't know the family or Ana, but I'm quite certain neither Ana nor the Marquez-Greene family deserved this outcome. If you'd like to help the Marquez-Greene family out, the Ana Grace Márquez-Greene Music Scholarship Fund has been set up at Western Connecticut State University, and the Ana Grace Márquez-Greene Family Therapy Fund has been set up at the Klingberg Family Centers. Donations can be made in Ana's name to the Artists' Collective in Hartford as well. Thank you to all who have helped, are planning to help, and will help. Your efforts will not go unrewarded or unappreciated. To all the families in Newtown who lost a loved one, HBIC is truly sorry for your loss, and I hope that there will be brighter days in the future for all of you. The Bridgeport Sound Tigers are helping to remember the names of those children who were so brutally taken from the world before they even began realizing their potentials, and I'm happy that they are doing it with an extreme amount of class. Rest in peace, children. Raise your sticks in their honour! One of the more interesting topics came up on The Hockey Show last night as we had a caller phone in and talk to us about how he and his friends warmed their feet and hands while playing pond hockey as youngsters. Beans and I were having a laugh at this, but it occurred to me that this might actually be a problem for kids and parents when playing or watching hockey outside. I normally dress warmly for the weather and I never find myself cold, but I can see this being a concern for parents and skaters alike. The phone call came from Terry who described, in detail, how he and his friends used to come off the ice into a barn on the farm where the cows were held. They would then find a cow and place their semi-frozen extremity - hand or foot - between the cow's leg and udders to warm up! There aren't too many urban barns with cows in them, so city folk don't have this "luxury". And I worry about the safety of a child crouching down beside a very large, heavy animal and place his or her cold hand or foot on a cow in a very sensitive place. Times were different in yesteryears, and this is one example of those differences that the new generation hear. Beans spoke about how he uses baby powder to keep his hands and feet dry when playing, and I have used this method as well on my hands. If there's one thing I've noticed over my many days of skating this winter already, it's that my hands become very dry. Without the ability to douse my hands in water while skating, I've taken to becoming a moisturizer. I feel like George Costanza in saying that. While I'm not yet a hand model like George Costanza was, my hands are not as dry this winter as they were in previous years. I'm thankful for that because they crack and just look and feel ugly. The ugly, however, isn't a concern as much as the pain of cracked, dry skin is! Therefore, moisturizer and I have become better friends this winter. Even though it feels somewhat unmanly to write that. I know some people use handwarmers as seen to the left. They work for long periods of time, and they seem to be pretty effective. My better half has a vast collection of them as she finds her hands to be ice-cold even on the mildest of winter days, so I do have proof that they work effectively. She and I have gone skating often this winter, and she hasn't complained once about her hands or feet being cold. This is an activity we'll continue to do as long as her supply of handwarmers remains stocked. I have seen vast numbers of people - fans, coaches, parents - holding Tim Hortons cups in and around rinks, and this phenomenon happens outdoors as well. Thermoses of coffee, hot chocolate, and other drinks make appearances as well for those looking to keep warm, so there are those options as well, albeit they are temporary for as long as the heat and/or drinks last. As seen on the top photo, a Timmys and a warm blanket may make the difference! So I ask you, readers, what do you do to stay warm while playing or watching hockey? Do you find that watching or playing outdoors dries your skin out like it does for me? Any solutions other than moisturizing that you use? Add your voice to the conversation in the comments as I'm curious to see what remedies others have for these problems! If you're in an area where outdoor ice is plentiful, get out there and have a blast. Outdoor ice is usually harder and faster than indoor ice, and there's nothing like skating into the fresh, crisp outdoor air on a cool winter day! The Hockey Show, airing tonight at 6:00PM CT on 101.5 UMFM, is bringing you a Christmas Extravaganza tonight as we clean out the shwag bag and offer up gifts for all! Tonight, we'll be giving away a ton of prizes - t-shirts, DVDs, autographed pucks, board games, a jacket - as we want to thank our listeners for tuning into our show. We realize that we may not cover things from week to week as you'd like us to, and that's ok. We still appreciate that you listen and give us a chance to talk a little hockey with you. Phone lines will be open tonight, so call us at (204) 269-8636 for your chance to win! In terms of making this Christmas miracle come true, we'll get our pile of prizes organized into lots. If your call is selected, you'll get to select a lot in terms of prizing. The key, however, is that we're not to reveal which lot has what prize. In other words, if you want a t-shirt and you select lot #6, you might end up with an autographed puck instead! Teebz and Beans are playing Secret Santa tonight! I understand that this may turn some fans off, but it's Christmas. You don't get a preview into Christmas gifts under the tree, and sometimes you happen to get something you may not want initially. That's the risk of having other people provide you with a gift, so Beans and I will play Santa tonight and offer up gifts to you based on your lot selection. All I can say is that I'd be comfortable receiving any of the gifts FOR FREE, so call in and win yourself something nice! If you're out of town, we do use the mail system as well, so don't think we're limiting prizing to the local listening area. Hit up the UMFM website and listen live as well! If you win a Secret Santa gift, we'll mail it out to you! It's a Christmas Extravanganza tonight on The Hockey Show, so call in to win betweenm 6:00pm and 6:30pm CT! "Hey @FloydMayweather pick up your phone cause I'm callin#imdifferent @jduppal pic.twitter.com/UZ3GYO4K"
Now, I know that as a 21 year-old I did some stupid stuff. While I never had the available monetary resources like Mr. Kane has, I'm quite certain that my actions were sometimes reprehensible. I learned from these mistakes, though, and I'm not going to hold Evander Kane to a different standard because he's an athlete. He's still growing and learning as an adult. He's certainly learning all about his actions today as fans hammer him with rage over his apparent flaunting of his riches. 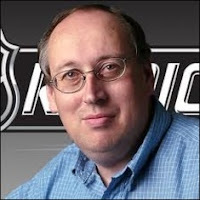 Kane did offer an apology to those fans today after being contacted by Ken Wiebe of The Winnipeg Sun. “Nothing really surprises me any more,” Kane told Ken Wiebe. 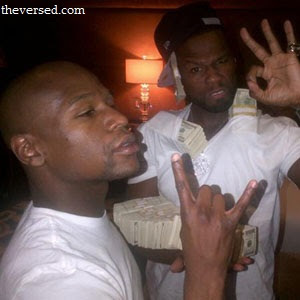 “I posted the tweet, reaching out to Floyd as a joke, thinking he would recognize that because he’s done that before. I guess it is what it is and there’s not much I can do about it now. Sometimes people can look at a picture and come up with a thousand different stories. The problem with inside jokes are that if you're not on the inside, not many people get the humor. While I will give Kane the benefit of the doubt in this case since his reasoning does make sense. 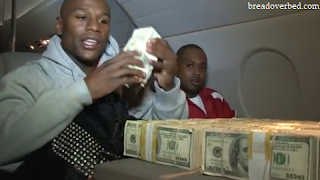 Boxer Floyd Mayweather's nickname is "Money", and he has been caught "flaunting" ridiculous amounts of money in the past. Kane's learning that fame sometimes can get you in trouble. My hope is that he's taking these lessons and absorbing them so that he doesn't find himself in hot water with fans again. As for the NHLPA and their stance in the lockout, they can deal with Kane as they see fit. But the fans need to remember that's he's still just a kid. 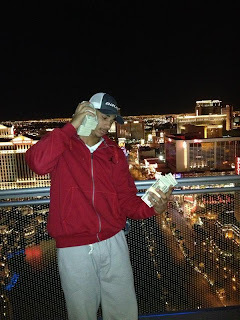 If anything, Evander Kane, remember from where that money is coming. Winnipeg isn't Atlanta. Winnipeg is a blue-collar town that loves its hard-working stars. The 15,000 people that cheer your every goal have worked their rear ends off to afford the luxury to cheer you on, and this type of joke doesn't go over too well on them when they don't understand the punchline. Work hard, play hard, but don't show up the city or the fans that made you rich. 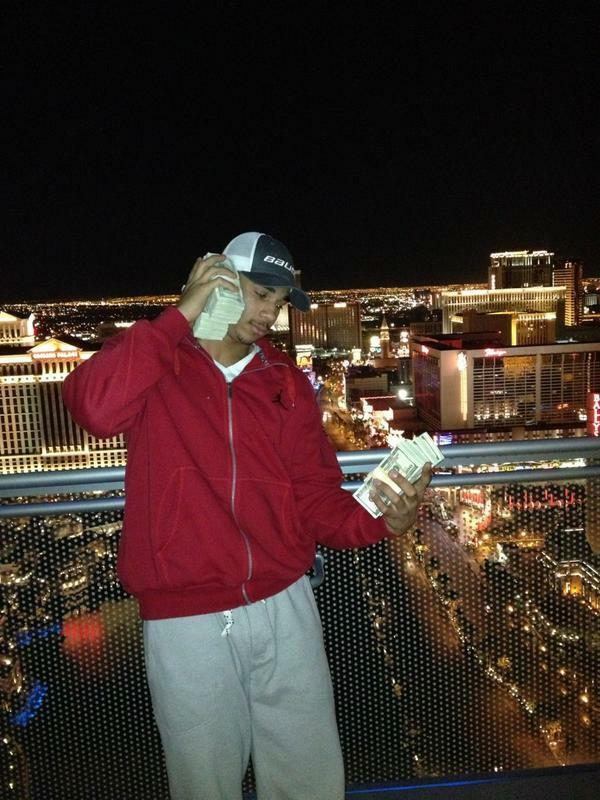 Evander Kane will be fine as long as he comes back and has another great season. If he plays like did in the KHL, though, the catcalls will be plentiful for what has happened while he wasn't wearing Jets' colours. If you're not gearing up for the World Junior Championship or the Spengler Cup coming up at the end of the month, you either aren't a hockey fan or don't have a pulse. This might be the best hockey we see all year, and possibly until next September! I'm already excited, and I decided to start brushing up on my IIHF facts and statistics in case I'm called upon by TSN to be an analyst. 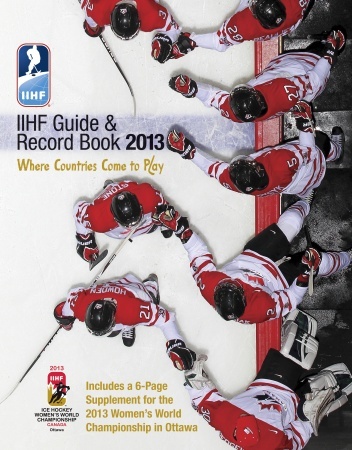 Chances are pretty darn good that I won't be asked, but, in case I am, Teebz's Book Club is proud to present the IIHF Guide & Record Book 2013, compiled and written by the International Ice Hockey Federation and published by Fenn/McClelland & Stewart. While it would be a stretch to say that I read this book from cover to cover, I do possess a larger quantity of IIHF stats and records thanks to my flipping through this book to certain chapters. Reading this book, if you can call it "reading", was a little dry, I must admit. It's not like there's a story being told about hockey unless you read deeper into the facts and statistics presented. The section about some of the records held in international hockey was pretty amazing, though. Were you aware that Canadian and former New York Islander Pat Flatley still holds the record for most penalty minutes at the Olympics Games with 70? Or that Flatley set the single Olympiad record for most penalty minutes with 70 in 1984 in Sarajevo? Or that Czechoslovakian star Vaclav Nedomansky still holds the record from 1972 for most points in one game with eight against Poland? There are a ton of facts like this in the IIHF Guide & Record Book 2013, and you'd be surprised at some of the records and information found in here. Andrei Mezin of Belarus will always be remembered for his stunning win against the Swedes in 2002, but he's also the goaltender who has recorded the most Olympic losses in his career with ten. Tomas Vokoun of the Czech Republic leads all goaltenders with two assists in Olympic play, and Canada's Sean Burke still holds the Olympic career penalty minutes mark with 16 PIMs to his name. As I was reviewing the statistics and records for the World Junior Championships, I realized that I have been fortunate in seeing a vast number of superstars play before they hit the NHL. Players such as Peter Forsberg, Markus Naslund, Alexander Ovechkin, Sidney Crosby, and Eric Lindros are all household names, and I got to see these players work their magic as juniors before making it big in the NHL. To give you an idea how good some of these players were, here's some perspective. Ryan Ellis, the speedy Canadian defenceman who suited up from 2009-11, has 20 assists in his World Junior Championship career and sits third all-time. Peter Forsberg, the leader in career World Junior tournament assists, recorded 24 assists in 1993 alone! Forsberg owns the career points and assists records, as well as the single tournament records for points and assists. Forsberg was a beast as a junior-aged player! IIHF Guide & Record Book 2013 is an absolute treasure trove of information, and it will be sitting next to me as I watch the World Junior Championship this month. From giving me the information on the head-to-head records between countries to scanning over possible records that could be shattered, IIHF Guide & Record Book 2013 has it all. Because of its vast amount of information and thorough telling of it all, IIHF Guide & Record Book 2013 absolutely deserves the Teebz's Book Club Seal of Approval! It will be my hockey companion throughout the entire tournament as I get myself ready for the best hockey seen on TV thus far this year! If you're a Canadian, the sports channels and online media have been dominated by the news that the Toronto Blue Jays acquired Cy Young winner R.A. Dickey from the New York Mets. The Jays arguably boast the best starting five in the American League East, if not the entire American League, but there was a common theme to the Jays' recent flurry of moves: you won the winter, now go win the summer. It got me thinking about some of the trades that NHL teams have made to help them win a Stanley Cup, and there have been some notable ones that have paid immediate dividends in hoisting the Silver Chalice. In 1980, the New York Islanders were missing that intangible quality known as grit. They had lots of skill in Bossy, Trottier, Tonelli, Potvin, Morrow, and Smith, but they needed that grinding, son-of-gun player who could wear the opposition's top line down while potting a few key goals. Los Angeles had a player who fit the mold perfectly as 29-year-old center Butch Goring was the piece for which Bill Torrey traded. 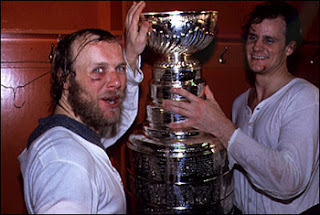 While giving up Billy Harris and Dave Lewis was thought to be a high price, the return that Goring brought was a Stanley Cup in 1980. And 1981. And 1982. And one more in 1983. Not such a high price when you have that much hardware pouring in. In 1991, the Penguins were rallying around Mario Lemieux, Kevin Stevens, and Jaromir Jagr, but teams knew that if they shut down that line, the scoring was thin behind them. The Penguins went shopping for a second-line scoring threat and found themselves two key cogs in their run to the 1991 Stanley Cup. The Penguins dealt John Cullen, Jeff Parker and Zarley Zalapski to the Hartford Whalers for Ron Francis, Grant Jennings and Ulf Samuelsson. The result? A Stanley Cup in 1991 and 1992 for the Penguins. The Whalers, on the other hand, would relocate to Carolina few short years later. Needless to say, the addition of Francis gave the Penguins two phenomenal centermen, and getting Ulf Samuelsson to patrol your blueline is a heckuva pickup. In December of 1995, the Montreal Canadiens were being thumped by the Detroit Red Wings who simply outclassed them on this night. Patrick Roy, in net for the Habs, surrendered an astounding nine goals on a night that would see the Canadiens fall 12-1 to the Winged Wheelers. After the ninth Detroit goal, head coach Mario Tremblay yanked Roy who told team president Ronald Corey he'd never play for them again. Days later, Roy and captain Mike Keane were headed for Denver as they were swapped for Andrei Kovalenko, Martin Rucinsky, and Jocelyn Thibault. 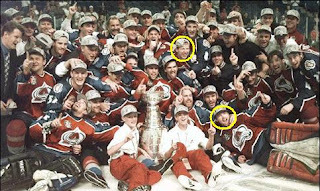 As one-sided as the trade looked at the time, the 1995-96 Colorado Avalanche would win the Stanley Cup over the Florida Panthers in a sweep with Roy and Keane both playing a large part in the Avalanche's success. Five years later, Roy would hoist a second Stanley Cup with the Avalanche as well. The Detroit Red Wings, having been ousted by the Colorado Avalanche in a violent and physical series in 1996, needed to add some additional scoring and toughness, and they set their sights on one player. Brendan Shanahan had made it known that he was unhappy in Hartford and wanted to play for a contender and in front of passionate fans. Detroit offered up a hefty bounty at the beginning of the 1996-97 season: Keith Primeau, Paul Coffey, and a first-round pick in the 1997 Entry Draft for Brendan Shanahan and Brian Glynn. The result? Shanahan led the Red Wings in goals and points in both the regular season and the playoffs, and led the Red Wings to the 1997 Stanley Cup! Giving up Primeau, Coffey, and a first-round pick seemed like a lot, but Shanahan helped to deliver three Stanley Cups in his nine years in Detroit - a pretty good return for giving up a lot! While there are some other trades that certainly made an impact and helped teams win a Stanley Cup - the Jeff Carter move that helped the Kings, for example - the price paid by the teams who made the deal to win in the present was considered high. Just as the Blue Jays did, they sacrificed assets to bring home a Stanley Cup, the game's highest honor. While I'm not saying the Blue Jays will win the World Series, it goes to show that the right move to put a team over the top can result in great things! I feel pretty lucky living in Canada in that we have some incredibly good hockey-related programming being produced without the actual game being played. TSN will be carrying the World Junior Championships at the end of the month, and those broadcasts are amongst the best on the planet. The CBC was always responsible for Hockey Night In Canada, but with no hockey being played they have allowed other programs, such as This Hour Has 22 Minutes, to produce some quality segments about the game. Tonight, though, I took in one of the best documentaries on concussions I have ever seen, and I have the CBC's The Passionate Eye for showing this excellent piece of journalism. The film shown was entitled Head Games, and it featured interviews with Keith Primeau and Dr. Ruben Echemendia amongst those from the hockey world interviewed for the documentary. Primeau, as you may know, was forced to retire from hockey due to his battle with concussion-related problems while Dr. Ruben Echemendia is the Director of the NHL/NHLPA Concussion Working Group. Primeau got a lot of the airtime committed to the hockey side of the story, and he revealed that he's still affected by some symptoms amongst all that about which he spoke. The trailer for this documentary is below. There are a lot of great moments in Head Games where people say things about concussions that will almost make your jaw hit the floor, and I assure you that the trailer doesn't show any of these. While the full movie would have been great to find online, you can actually get yourself a DVD copy of Head Games by hitting going over to the Head Games website and getting yourself a copy. DVD copies are $13.99 while the Blu-Ray copies are $18.99. To make that offer a little sweeter, though, if you use the code HEADGAMESCBC when checking out, you can save yourself 10% off the price! Solid deal, right? Head Games was named the Best Documentary at the 2012 Boston Film Festival and was an Official Selection at the 2012 International Documentary Film Festival in Amsterdam. A vast number of highly-respected film critics gave Head Games some very favorable reviews. Sounds like it might be good, so what are you waiting for if you have any interest in the epidemic of concussions? 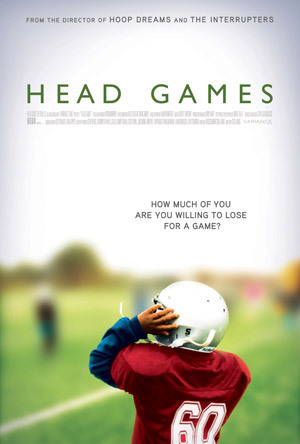 Inspired by events from the book Head Games written by former football player and WWE wrestler Christopher Nowinski, Head Games the film will open your eyes to some of the incredible research being done and some of the scary facts that doctors have found out about concussions and the long-term effects they have on a player's day-to-day life. It was, in my opinion, one of the best documentaries across any topic that I have seen to date. My advice? Do yourself a favor, pick up a copy of Head Games, and decide for yourself when to draw the line when it comes to living life with a healthy brain and appearing on SportsCenter for that one big hit. It's an easy line to draw for me now, and I'll be much more careful with my own brain from this point forward. I might be late to the party on this one, but the above uniform image is what the Hershey Bears will be wearing on outdoor ice when the Bears meet the Wilkes-Barre/Scranton Penguins at Hersheypark Stadium on January 20, 2013. Honestly, the look of this uniform is pretty awesome, but the one thing that stood out was the pants. They're white! Word came out, however, that the Bears will be wearing their normal brown breezers instead of the white breezers shown, so we won't get to see Washington's AHL affiliate conjuring up memories of the Capitals' white pants just yet. While the idea of white pants is a great idea, the practical use is not so great. White nylon, when wet, tends to start going transparent - modesty not included! I do happen to like the look of these jerseys, though. They have that traditional feel to them, and the stripes really stand out in terms of the contrasting color. If there's one design underutilized in hockey, stripes would be it. I think this uniform will work well on the outdoor rink, and Hershey should be proud of the way the team will look on January 20. 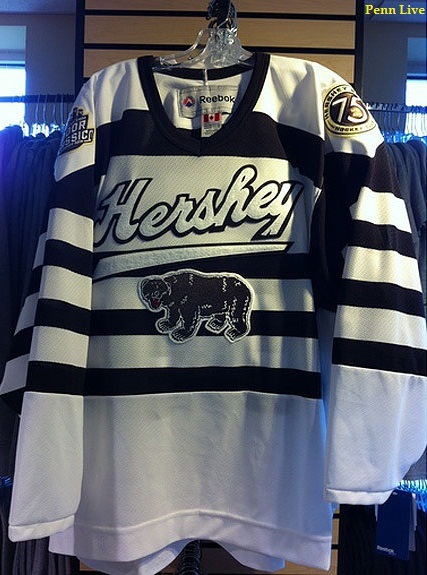 Here's a larger look at that Hershey jersey, thanks to Penn Live. Again, high marks from this writer, and kudos to the Bears for staying classy. What do you think about the AHL Outdoor Classic's first unveiled uniform? Good, bad, indifferent - leave your comments below! 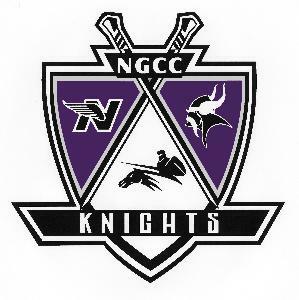 I'm all for going to watch kids chase their hockey dreams, and heading down to the local rink and community center is a great way to find those dream chasers. There is an innocence in seeing kids playing shinny and working on individual skills, but older players certainly need some structure and a coach is supposed to provide that. One coach in Winnipeg, however, seems to have taken the practice of coaching a few steps too far as he was teaching his team the finer points of fisticuffs - something that Hockey Manitoba has worked hard at reducing in the game in the province. Hockey Winnipeg and the St. Vital Minor Hockey Association are investigating claims that the Norberry-Glenlee Knights midget A-1 team, a squad of 16 and 17 year-old players, was run through a fighting drill of some sort that left many shaken and one player with a concussion. Allegedly, the unnamed coach instructed his players on how to throw uppercuts so that they weren't throwing punches into the cages required by Hockey Canada. Hockey Manitoba was alerted of the issue through a letter from a parent. "Hopefully, it's unfounded. If it isn't, it would be troubling," Peter Woods, executive director of Hockey Manitoba, told QMI Agency on Thursday of the allegation. Manitoba minor hockey prohibits all fighting, so a "drill" of this type would not only be against the rules, but it's downright tasteless. Hockey Manitoba doesn't rule on minor hockey infractions, leaving the decision of how to proceed with Hockey Winnipeg and the minor hockey association involved. However, any Winnipeg minor hockey player who fights on the ice is suspended with increasing severity as per the number of infractions - one game for the first fight, two for the second fight, three for the third fight with a review that could result in a suspension or ban from the league. This is where I'll weigh in. I had my share of scraps in my time, and I'm not the world's greatest fighter by any means. I was never, in my life, coached on how to fight either. Coaches, in my humble opinion, should be instructing players in how to be better players by teaching fundamentals and working on skills that will not only make the player a better hockey player, but a better all-around human being. Teamwork, work ethic, communication, problem solving, and the ability to listen may not seem like lessons that are being taught, but the good players learn these valuable lessons early and go on to greater heights. I never once had a hockey coach teach me how to fight nor encourage me to fight. I learned how to fight by goofing off at the local rink with friends. It was there that I discovered something about hockey fighting that you never really see when two professional players go toe-to-toe: IT HURTS LIKE HELL! Your fists and knuckles are sore and swollen most often, and getting punched is no fun either! I could fight because I have a pretty long reach and I'm a bigger guy, but I'll be the first guy to tell you that getting punched is not as glamorous as it looks on TV. And the results the next day aren't pretty either. If I were ever to hear a coach telling a kid to fight, I'd have a serious problem with that. We saw how the Broad Street Bullies changed how the game of hockey was played in the 1970s, and it was a pretty ugly game when they were on top. Worse yet, the "Canadian way" of beating European teams into submission through physical and, sometimes, dirty play was proven to be ineffective against a skilled team like the Soviet Union. Skill can beat physicality on most nights, and that's what we should be teaching the next wave of players. While I don't know who this coach is, I'm guessing he's going to be reprimanded for this "coaching". Personally, I'm not sure I'd be comfortable playing on a team where my coach wanted me to fight another player on my OWN TEAM, let alone any other team. The fact that one player may have been concussed should give this coach a lot of time off if the allegations hold true. What say you, readers: should he be reprimanded and suspended if the evidence proves true, or is this a coach just teaching the boys to play the "Canadian way"? Let me know in the comments how you feel about this story! The Hockey Show, airing at 6:00PM on 101.5 UMFM, has a special guest on the show tonight as we work towards Christmas Day. Yesterday, I featured a review on Tal Pinchevsky's book entitled Breakaway, and today we feature Mr. Tal Pinchevsky himself on The Hockey Show! I'm going to say upfront that we will not be discussing the lockout, the CBA, or anything with the words "lock" and "out" in the same sentence with Mr. Pinchevsky as he works for NHL.com. I am not going to ask him to put his job with the NHL at risk for any reason. Please be aware that if you're tuning in to hear someone talk about the CBA and the labor war going on in the NHL, you won't hear it this week whatsoever. We will, however, be talking about Breakaway, some of Mr. Pinchevsky's favorite hockey moments, his favorite team or teams, his favorite player or players, and bunch of other stuff. I encourage you to tune into 101.5 UMFM on your radio if you get the channel or head on over to the UMFM site and listen live! If you have any questions you'd like to ask Mr. Pinchevsky, please tweet me sometime today at @TeebzHBIC on Twitter and I'll try to work your question in. I'm very excited to speak to Mr. Pinchevsky about Breakaway, so tune into The Hockey Show tonight! And just to keep the Christmas spirit on The Hockey Show alive, we will be giving away some more stuff tonight! Tune in from 6:00pm to 6:30pm CT on 101.5 UMFM for your chance to win! Without any doubt, the inclusion of European players in the NHL has made the league a vastly better league due to the talent brought over from the European countries. From Peter Stastny to Sergei Fedorov to Petr Nedved, the NHL has seen a vast number of extremely talented players join its ranks. The one consideration that we, as fans, seem to forget about is that these men had to escape their countries in order to impress us with their talents. Escaping a Communist country was no short order before the fall of Communism, and the newest entry to Teebz's Book Club looks at the ordeals a number of high-profile players went through to escape Communist regimes and finally arrive in North America. Teebz's Book Club is proud to present Breakaway, written by Tal Pinchevksy and published by John Wiley & Sons Limited. This book is a fantastic look at what some of the most talented hockey players in history had to do to realize their NHL dreams. 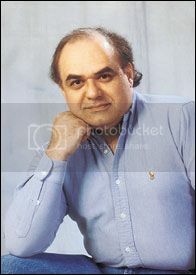 From the book's cover, "Tal Pinchevsky was born and raised in Montreal. Since moving to New York in 2001, Tal has written primarily about sports and popular culture for a variety of print and online publications, including the New York Times, ESPN the Magazine, Rolling Stone, the New York Post, Spin, the Source, Men's Fitness, Time Out New York, The Hockey News, and Madison Square Garden's web site, MSG.com. He is currently a staff writer and producer for NHL.com." Mr. Pinchevsky graduated from McGill University, and has also contributed to a few magazines and websites that are no longer in existence. Being that I was born in Canada, I have no idea what it may have been like to have lived in an oppressive society where the good of all is held above the good of the individual. I'm not downplaying that society, but it's never occurred to me that escaping the daily routine of bread lines and a few dollars for a day's worth of work was so difficult for the most talented athletes in a country's history. Mr. Pinchevsky's work in Breakaway not only paints this picture for you, but he is thorough with his explanations and research so that you feel as if you're experiencing what these men experienced. The idea of hockey players defecting to North America is always a touchy subject in international politics, and was even more so with The Cold War still in effect. To have players from the former Czechoslovakia and Soviet Union risk life and limb, as well as putting their families still at home at risk of persecution, for their freedom by meeting representatives from NHL teams under the cover of darkness and in secrecy really highlights the difficulty these players had in getting out of their countries' regimes. The Czechoslovakian players were the first to escape their country after the Russian invasion in 1968 established a Communist regime in that country. Vaclav Nedomansky was the first player who broke away from his country in secrecy. The Stastnys followed, although their arrivals came at different times and each of the three brothers felt a different level of persecution upon them in trying to leave Czechoslovakia. Michal Pivonka, Petr Klima, Frantisek Musil, David Volek, and Petr Svoboda all had vastly different stories about their escapes from the Communist Czechoslovakia, and all went on to success in the NHL. The legendary Green Five - Krutov, Larionov, Makarov, Fetisov, and Kasatonov - were the exceptional players being scouted by NHL teams when they were destroying amateur records across the planet. These five men were the backbone of the dominant Soviet teams in the 1970s and 1980s, and yet all of these men wouldn't reach the NHL until they were in their thirties. All but one of these men would take exception to the way that Viktor Tikhonov and the Soviet system prevented them from playing on the bigger stage of the NHL. But they all would eventually suit up in the NHL after finding their own ways out, and this led to younger Russians defecting in the wake of the fall of the Soviet Union thanks to the trail these men blazed. Breakaway highlights the reasons why each of the men profiled wanted out of the Communist way of life, and documents how each man escaped. Some of the players simply left their respective national teams while on tour. Others, however, met NHL representatives under clandestine circumstances and had to be whisked away before security teams discovered these players missing from their rooms. Each story seems like it was taken out of some spy story, but the truth of the matter is that each of the men profiled risked his life in escaping to North America. Mr. Pinchevsky has done a marvelous job in bringing these stories to life in Breakaway. To give you an idea of how difficult and dangerous escaping was for some of these players, this excerpt from Michal Pivonka's and his girlfriend Renata Nekvindova's defection should give you some perspective. "At the time, young Michal and Renata were not able to comprehend the incredible risks they took in the woods that afternoon. Renata had barely gone on vacation before. It's only later, after discussing that night with Poile and Button, whom they met across the border in Trieste, Italy, that Pivonka truly understood the danger in what he had done. 'You were in Yugoslavia and a couple of hundred yards later you were in Italy. If you get caught in that zone, I guess they [border guards] could shoot at you. But for whatever reason, everybody was out for lunch, the guards.'" Defecting was as scary as the players in the book make it out to be, and Mr. Pinchevsky has done a wonderful job in conveying the emotion and danger in some of the situations that the players speak about in Breakaway. 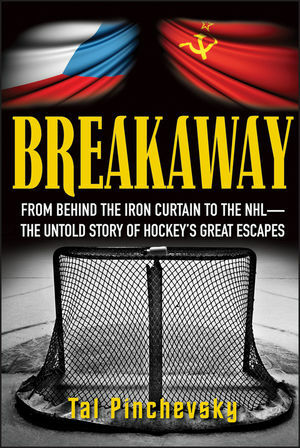 I found Breakaway to be a captivating book in which I learned a great deal about how much effort it took from both the players and the teams that were working to secure their freedom to get them on North American soil. Breakaway is a fantastic book that really brings light to the stories of some of the best European and Russian players to ever lace up their skates and their determination to escape Communism to play in the NHL. Because of Mr. Pinchevsky's excellent writing and the stories contained within the covers of the book, Breakaway absolutely deserves the Teebz's Book Club Seal of Approval! If you're looking for any Christmas gift ideas for your hockey fan, Breakaway does have some PG-rated language, but would be suitable for teens and older. It is an excellent book that really shows the history of the era in which these fantastic players played, and deserves to be read by anyone who loves the history of the game! Highly recommended read! If you've been a hockey fan for a while, you're very away of Roch Carrier's childhood story known as The Hockey Sweater. I reviewed the book as part of Teebz's Book Club, and it really should be a staple in any hockey fan's library. While the story surrounds a young boy's love of the Canadians and his idolizing of Rocket Richard, it may not resonate with younger hockey fans who follow today's game. Because of this, the CBC's This Hour Has 22 Minutes, a satirical comedy show, has happily provided an update to the childhood story. If there is one thing that any younger fan knows all too well about the NHL, it's that these lockouts are a regular occurrence much to the chagrin of all the older fans. 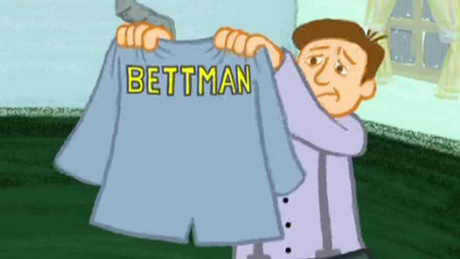 But because they happen with such regularity, This Hour Has 22 Minutes is happy to update The Hockey Sweater as they present The Lockout Sweater on tonight's episode! Take a peek at this after the ads run (sorry, I can't control those). This cartoon's a beauty! Pretty great, right? I found myself laughing as the parallels between Monsieur Carrier's story and this story are close, but easily separated by This Hour Has 22 Minutes's satirical look at the NHL lockout. Honestly, this is a great cartoon, and certainly worthy of a few laughs. While the CBC may not be producing their excellent Hockey Night In Canada broadcasts because of the lockout, it's nice to see some other CBC franchises benefiting from hockey's extended layoff. This Hour Has 22 Minutes easily is the first star of Canadian television on this night!